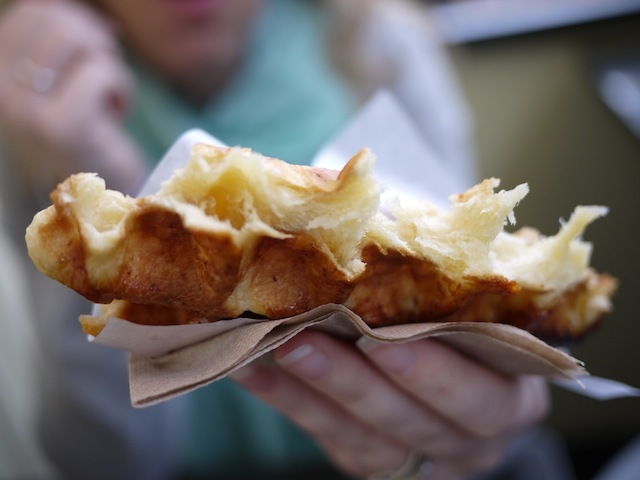 Wannawafel Review – Authentic Belgian Waffles In Market Square (Victoria, BC)! We had been eager to try Wannawafel ever since we saw the Belgian family owners on an episode of Dragon’s Den. Jim was raving about the waffles, claiming they were the “best he’s ever had!”. The owner/founder seemed like such a great guy, and someone you really wanted to root for. We finally got our chance to try Wannafel this week when we were visiting my family on the island. 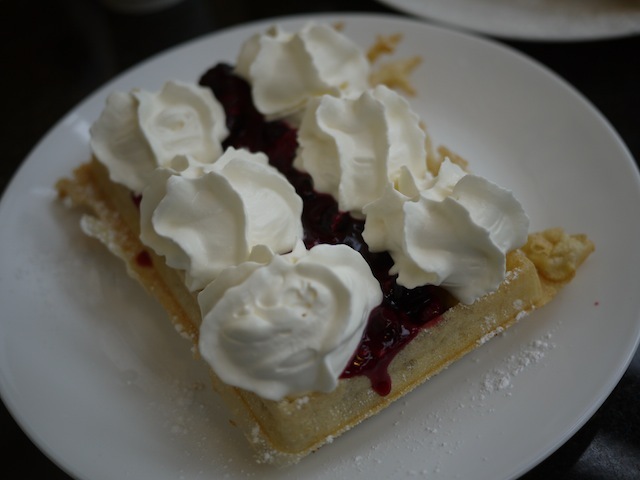 Located in downtown Victoria, Wannawafel is a little waffle joint in Market Square serving authentic Belgian waffles. 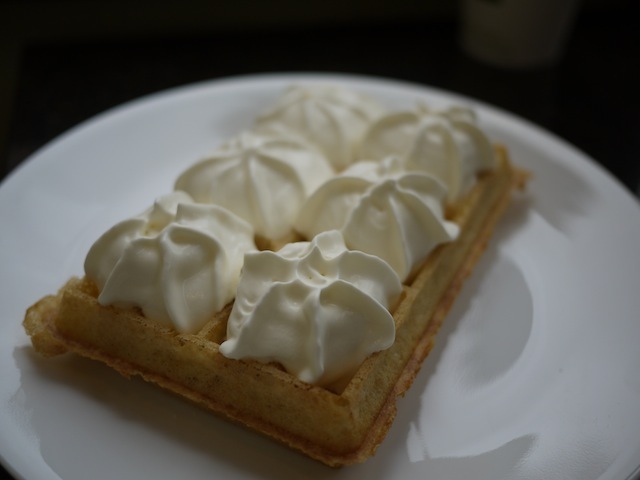 Offering made to order Liège and Brussels styles – similar to Sweet Iron Waffles, but unlike waffles sold at our beloved Pattiserie Lebeau. The cashier was very patient with us while we all customized our waffles to our specific desires. 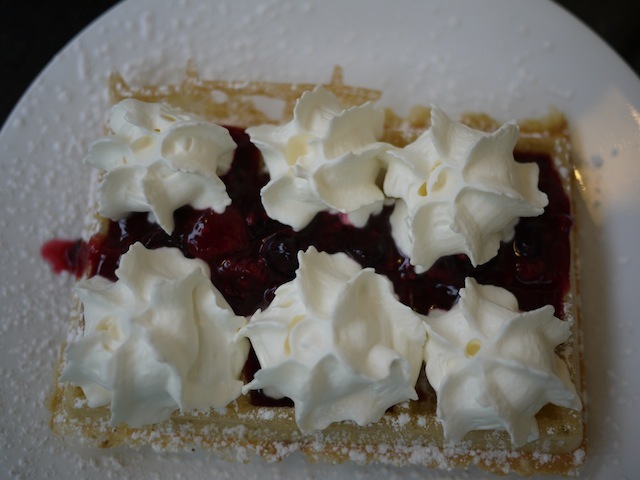 At Wannawafel, you can choose either a Liège or Brussels waffle (both $3.58 each), and then pick your toppings: complimentary icing sugar, real whipped cream $1.00, vanilla ice cream (per scoop) $1.50, Belgian chocolate sauce $1.50, and fruit compote $2.00. We ordered four waffles with toppings, and one plain Liège. The above are Brussels with whip and compote, and one with just whipped cream. Their Brussels waffles are light as air, crisp when cutting into them, buttery smooth, and sugar free. 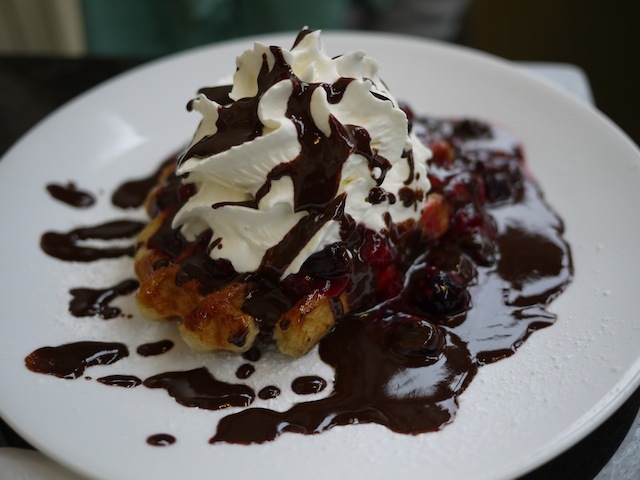 Liège waffle with fruit compote, Belgian chocolate sauce, and real whipped cream. Whoa! This was like a rich and sugary dessert, but my mom enjoyed her waffle customization. Brussels waffle with fruit compote, whipped cream, and icing sugar. This is my favourite way of eating waffles, fruit + whip. Since the Brussels variety was so light, it meshed well with toppings and didn’t feel as overindulgent as the dense Liège with all its condiments. Wannawafel was so delicious, we even ordered a plain steaming hot straight-from-the-iron Liège waffle to see how it tasted without any toppings. The verdict? Amazing. You could easily eat this as a quick snack on the go, as it didn’t need any additional toppings. It was slightly chewy and caramelized on the outside and its interior was soft and sweet. Almost like a cross between the flakiness of a croissant with a dense and sweet brioche bread. The sugar granules had melted slightly, so you didn’t feel like you were biting into chunks of crystallized sugar balls like the Liège waffles at Pattiserie Lebeau. 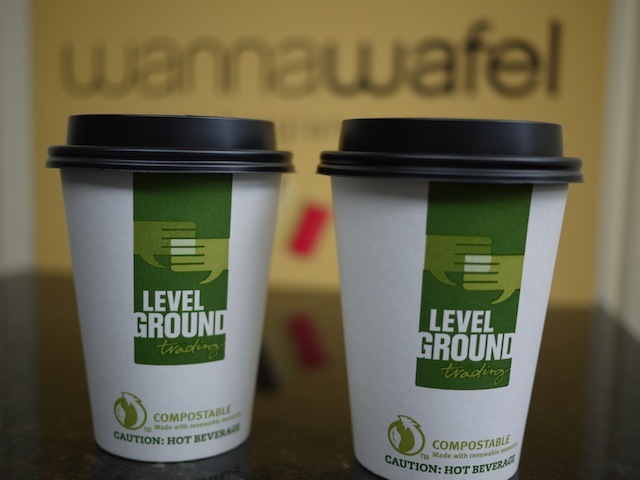 Bonus: They serve direct fair trade, organic Levelground coffee ($2.00 medium) – a Canadian family founded local company based in Victoria. 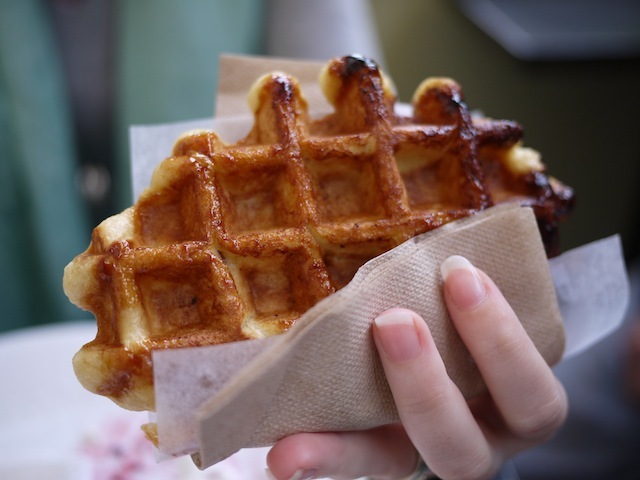 If you’re in downtown Victoria, and love Belgian waffles, check out Wannawafel in Market Square!